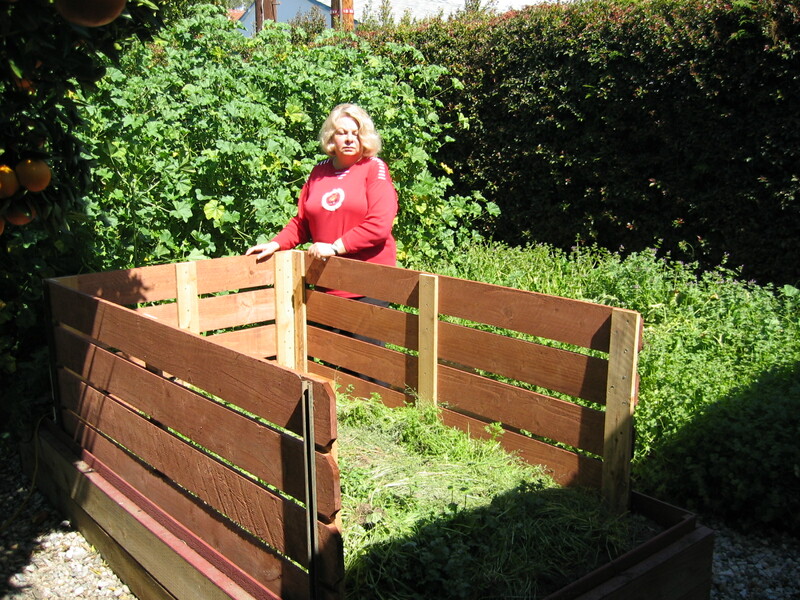 Build a garden compost for retirees. After our trip to our cites recycle center we decide to build a larger compost bin. We had a small plastic 50gal size unit supplied by the city but needed a larger one. So as retirees we decided to build one. Due to a water shortage in our area we decided to get rid of half of the rear lawn which was dying in the summer heat, and build five 8′ x 4′ planter boxes above ground, surrounded by gravel. Instead of looking at brown areas of the rear lawn we had planter boxes. This was less area to water. In one of the planter box I built a compost box consisting of 6′ by 5″ fencing board at approximates $1.25 each at Lowes. With this and various scrap lumber left over from previous projects we built the box. The total cost came to about $30. So now we compost all our kitchen scrap, including bones and meat. It all breaks down Our regular trash now consists of mainly food plastic wrappers and old shopping bags. We mainly take our own bags to the store so we do not have many plastic shopping bags to discard. You may have noticed that the garden is rather green. This is from our recent rain storms we had just had. I noticed that plants seem to grow very well with rain water not as well with city tap water. It makes you wonder what is in the city water! This recent rain has not alleviated the water shortage problem. 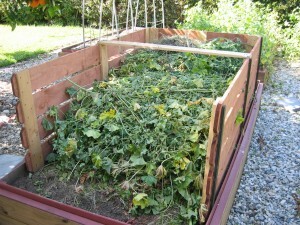 Break in the rain storm we just had, so I trimmed the other boxes and used the foliage to fill up our new compost box. Learn to turn your leaves, grass and food scraps into rich nutritious soil for your yard. Composting food scraps, mulching leaf clippings and “grasscycling”(leaving grass clippings on the lawn) are powerful landscaping techniques that save energy, water, road congestion, air pollutants and help to reduce chemical exposure. Keep yard clippings on site and let nature do the work. This technique also lends itself to supporting Burbank’s goal of Zero Waste by 2040. 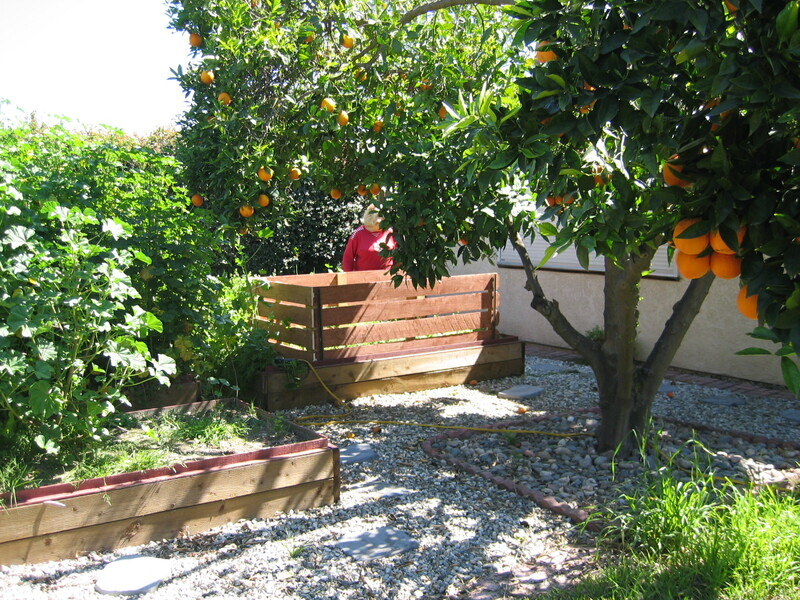 Compost bins are available to Burbank residents at no cost. Please call Burbank Recycling Center to RSVP (818) 238-3900. This entry was posted in Hobbies, Lifestyle and tagged compost, recycle, retirees. Bookmark the permalink. 1 Response to Build a garden compost for retirees. Very interesting about the water disparity between groundwater and rainwater. It would be interesting to see a case study where one plot was watered by ground water exclusively and the other by rainwater. Hmmm. Let your readers know that they can call the Burbank Recycle Center for a free compost bin and workshop if they are a local resident. (818) 238-3903. I also appreciate that you ended the article by letting your readers know that the recent rain has not solved our water woes. Its’ hard for the average person to understand if they don’t know how good a job we have done paving every surface area so that water moves to the ocean as swiftly as possible.